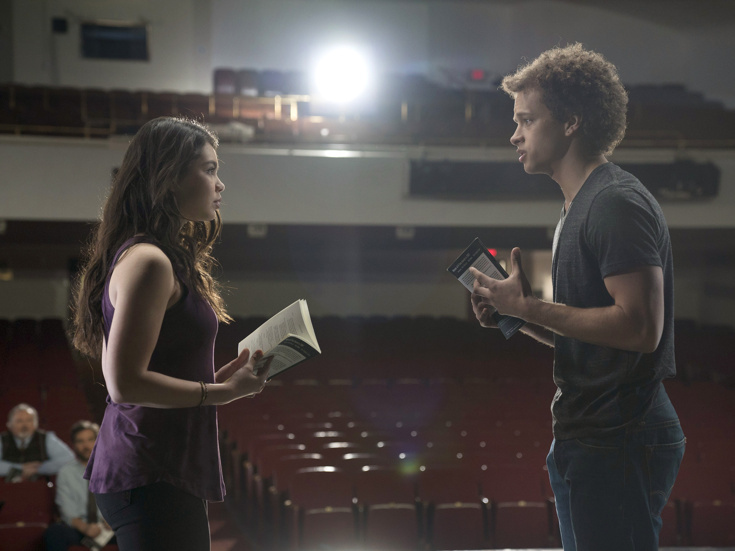 Auli'i Cravalho & Damon J. Gillespie in "Rise"
We've been counting down the days to the March 13 premiere of Rise, NBC's new musical TV series starring a slew of stage veterans. Atlantic Records has just announced that the show will release music from the show the Friday prior to each episode, with a full album of the series' tunes being released on May 11. In anticipation of the show's premiere, NBC has offered up a sing-along video of the cast delivering the stirring Spring Awakening act-one closer "I Believe." Watch below, and be sure to tune in to the premiere of Rise on Tuesday! Broadway's Frozen Releases Moving New Song "Dangerous to Dream"
Disney has filled us with so much excitement about the new music written for Broadway's Frozen. First we heard the stirring new tune "Monster," sung by Caissie Levy, who plays Elsa, then we were presented with a listen of "What Do You Know About Love?,” sung by the show's Anna, Patti Murin, and Jelani Alladin, who appears as Kristoff. Now, we've been given a chance to hear "Dangerous to Dream," another brand-new song sung by Levy and the show's cast. Sing along below and don't miss the chance to see Frozen live at the St. James Theatre. Stephanie Styles may not be checking into City Center's Grand Hotel, but she's most definitely bound for the big time. The Newsies alum has been cast alongside Tony winners Annaleigh Ashford and John Larroquette in ABC's new comedy series Three Rivers, according to Deadline. Three Rivers follows Rebecca Watts (Ashford), who leaves her Texas ranch to work at a fancy New York hotel. At the encouragement of her cowboy dad Beau (Larroquette), she returns home to transform their rustic ranch into a high-end destination. Styles will take on the role of the "pageant-ready" featured player Leanne. A premiere date for Three Rivers will be announced at a later date.